Fight among the ruins and rubble of a bombed airfield in the North African desert. The North African desert heat reaches unprecedented levels in the firefights of one of Battlefield™ V’s launch maps, an Axis airfield set ablaze by a recent Allied bombardment. Welcome to Aerodrome. Aerodrome is loosely based on the British attacks on German installations, supply lines, and airfields in the Libyan desert in 1942–1943. Commandeered by Erwin “The Desert Fox” Rommel, the German troops were forced to retreat westward through Libya and eventually surrender following the attacks. Dominating the landscape of this airfield (or, indeed, “aerodrome”) is a central hangar. A key strategic point that can be heavily fortified and defended, this will be a nest for infantry clashes, but daring tank pilots may also try their luck in what will be a severely contested area. The action on Aerodrome will take place on land, with infantry and land vehicles battling it out. Excluding air combat, all playstyles are supported; fans of close-quarter infantry combat will shine on the busy C flag, and land vehicle operators will have a blast rushing through the desert roads. There are many Fortification opportunities, which gives extra weight to Support players, and the map’s high points provide good sniping spots. Aerodrome is one of the two maps part of the North Africa campaign in Grand Operations, the other being Hamada. New to Grand Operations? You’re in for a vast multiplayer experience that takes you across fictional in-operation “days,” where each day is represented by a round played on a combination of a map and mode. The actions you, your squad, and your team take on day one will have a direct impact on gameplay in day two, which in result will impact on day three, and so on. Aerodrome is the setting of day three in the North Africa Grand Operation, where you’ll play Breakthrough mode. Here, the map is divided into several sectors, all owned by the defending team at the start of the match. The attackers’ goal is to take the sectors one by one in a sequential order, which is done by controlling all the sector’s available capture points. Sometimes, teams are so equally awesome that a winner can’t be decided after this third, in-game day. When that happens, Final Stand mode will be activated as a fourth day. In this event, Aerodrome will be the setting for a nail-biting last battle, where players can’t respawn after being killed. Last team standing will win the Grand Operation. A railway passage to the Aerodrome, the Depot is one of the two flags that the Allied side normally will attack first. Capture the point to reward your team with a tower overlooking both the Aerodrome Capture Point and parts of the B flag. The Depot can be an easy capture for a sneaky squad seizing the opportunity while the majority are fighting for the Aerodrome flag. Move to its elevated areas to see if enemies are knocking on the door. Another point close to the Allied starting position – roll over the hill pass towards the west with your squad to attack this one. Once you’re in control, Recon players can grab the elevated shelf called Overlook to cover the rest of their squad pushing into Control Points like the Barracks. The Axis team can capture this point to cut the Allied main road to the Radar flag. Mine the road and make sure someone with a Panzerfaust covers the Hill Pass. Although Fortifications favor the Allied side in this area, there's a trench by the eastern barrack where the Axis team can dig down in cover of elevated long-distance shooters. The heart of the map, point C will be high up on both teams’ wish lists. The outer corridors of the aerodrome hangar will be an infantry grind fest, while the open floor between the Stuka and Ju 88 planes is sure to induce paranoia for anyone fighting there. 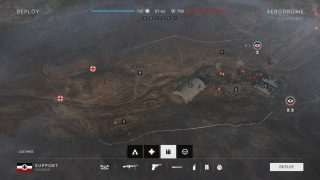 By holding the Aerodrome, your team can spawn on a very useful hub, which they can use to quickly attack flags A, B, D, and F. To do this, locate the Supply Stations and fortify the aerodrome’s hangar doors to cut the other team out. Players on point D will probably be busy with either deflecting incoming attacks or providing long-distance cover to squad mates moving toward nearby flags (use the handy water tower to achieve the latter). This is a great position for short access towards points like the Aerodrome. The Barracks are not easily accessed with tanks, but if you manage it, lick your vehicle wounds at the Vehicle Supply Station between this point and the Hangars. Close to the northern Axis HQ, this is one of the first two flags to grab if you’re deploying on the German side. You’ll fight near the remains of a British air assault and debris from destroyed planes along the airstrip. Make use of the cover inside the small hangars and fortify the northern hangar entry to defend against attackers. This is one of the map’s elevated points, where players can snipe to their hearts’ content while also defending a flag. If snipers from the Overlook flag harass your teammates, you can fortify the edge of the Radar ridge and pick them off one by one. Another valid strategy is to jump inside the radar building and cover your squad pushing towards the B, C, and D flags. Enjoy your fights on Aerodrome – and check out how to play on the rest of the eight launch maps so you’re prepared when you hit the battlefield: Narvik, Fjell 652, Rotterdam, Devastation, Arras, Twisted Steel, and Hamada.